DESCRIPTION: This may be regarded as a special interest book for professionals and dedicated enthusiasts, which entirely justifies the cover price. However, the publisher often heavily discounts books listed in the online bookshop, so a wider audience could be expected. Too large to be regarded as a pocket book, the author has followed the style of observers’ books that were once enormously popular with young boys and produced in several volumes to cover a range of topics including aircraft and ships. Each entry has one or more images, many in full colour, followed by a specification where available and then by a concise descriptive text. The coverage of the subject is comprehensive and uses the recently catalogued Smithsonian US National Air and Space Museum’s Herbert S Desind Photo Collection of more than 110,000 images. The entries collectively demonstrate the evolution of American missile design that was initially based heavily on German research and designs captured at the end of WWII. Each entry, where appropriate, includes a list of users. Some entries appear not to show all countries using the missiles, but the methods of loan and sale of some missiles by the US to allied or cooperating forces has sometimes been convoluted and even denied by US Administrations. 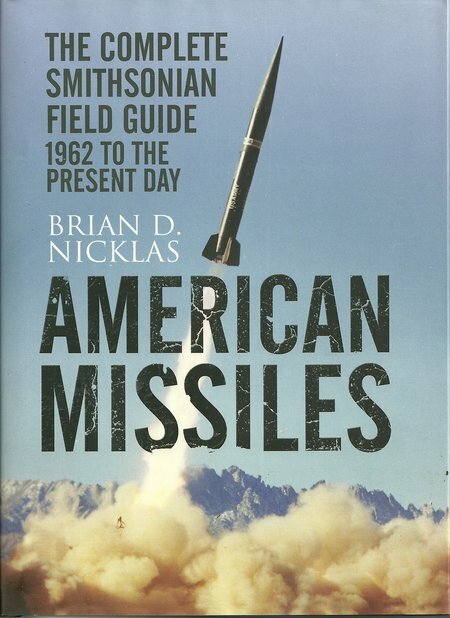 This book will probably become the definitive work on the subject for the period covered and provides fast access to facts on the range of US missiles produced since 1962. For anyone coming into the study of modern military aviation, this will be a key foundation book that will not only cover the missiles, but help to understand some of the fundamental points in military aircraft design and deployment. Most aircraft books fail to provide adequate information on the missiles, even though the missiles have a significant impact on the design and operation of the aircraft. Alternatively, missile books are frequently aimed at the professional and cover missiles for several countries during a brief period and in considerable detail. The bibliography contains a list of books of this type. The relationship between aircraft and missiles is important, for example, the Royal Navy Sea Vixen was the first British fighter designed without a gun armament. It was essentially a missile carrier, equipped with four active infrared missiles and two retractable batteries of unguided missiles. The infrared missiles were intended for use against fighters and lone bomber or maritime patrol aircraft. The unguided rockets were intended for use against massed Russia bomber formations, where the navigator/radar operator was expected to control the aircraft in the attack phase and fire his rockets much like a shotgun against a flock of birds. The Sea Vixen also had the ability to carry bombs and other types of missile underwing for use against surface targets, but the primary design of the aircraft was around its air to air missiles. In the same period, the US built aircraft that were also intended to attack large Russian bomber formations with unguided missile batteries as the principal armament.